I am dreading the arrival of July, August and September. Anything above 60 degrees is too hot, and makes me long for the cold weather that the fall and winter months bring. So when the temperature in Boston reached almost 95 degrees out of the blue in early June, I began to panic about the next three four months of heat. But luckily the heatwave was random, and it subsided after about three days. When temperatures reach the 90s, the only types of food that appeal to me are cold, clean and crisp ones, and nothing is more fresh and cooling than a spring roll packed with mint, cilantro and basil. 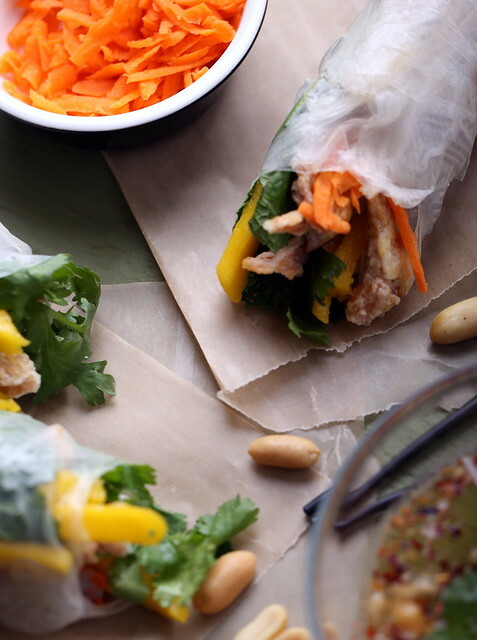 Here I’ve combined those herbs with some bright mango, crispy carrots, cold glass noodles and fried soy curls to create a spring roll with complimentary textures and clean flavors. Any leftover filling components can be tossed with the cold noodles the next day and drizzled with any extra sauce* to make an easy and refreshing lunch or dinner. Bring the water to a boil in a small saucepan. Then add in the rest of the sauce ingredients and stir until the sugar and salt has dissolved. Set aside to cool. Place them into a small saucepan with the broth and salt. Bring to a boil, then turn off the heat and allow the soy curls to rehydrate for 10-15 minutes. Drain the soy curls in a fine mesh sieve, and allow them to cool a bit. Then press down on them in the sieve to remove some of the moisture. Set aside. If you don’t want to deep-fry the soy curls, just place them into a hot skillet with a little oil, seasoning with a little salt as needed until they are slightly browned. Set aside and allow to cool. If you want to deep-fry the soy curls, place a few inches of oil into a small saucepan. Heat over medium-high heat for about seven minutes. While you are waiting for your oil to heat, place the cornstarch into a shallow, wide bowl. Whisk the Ener-G and water in a separate shallow, wide bowl. Test your oil by throwing a pinch of cornstarch into the oil. if it sizzle immediately, you are ready to fry. Place about a third of the soy curls into the Ener-G mixture. Give them a little squeeze to remove some of the moisture, then coat them in the cornstarch. Drop them into the hot oil and allow to fry for 3-4 minutes. Remove them with a skimmer and place on paper towels to drain. Season immediately with a little salt. Repeat the process until all of the soy curls are fried. Set aside and allow to cool slightly. If you are using glass noodles, just measure out about 2 cups of them once cooked. I stretch them into a long shape on a cutting board, then cut the amount I want with scissors as I go along. Now you are ready to assemble your spring rolls. There are several ways to roll them—I used this method (steps 4-8) for this recipe. Soften your spring rolls (only one at a time) by placing them on the palms of your hands and running them under some warm water for about 5 seconds. Then, place on a cutting board to roll them. Place some noodles (about the size of your index finger) at 9 o’clock on the softened spring roll. Then place a couple of mango slices on one side and shredded carrots and shallot slices on the other. Then place a few soy curls on top of the noodles, then top with a few cilantro sprigs and basil and mint leaves. Roll them up and repeat until all of the rolls are assembled. Chill or serve immediately with the cooled vinegar sauce. This looks amazing. Love your photos! Looks Delish! Thank you for this post! these are perfection! perfect for summer! I've definitely noticed an increase in the Soy Curl-inspired recipes since we all returned from Portland! Coincidence? 🙂 These spring rolls look phenomenal. I love the inclusion of mango in the mix. So tasty! I've had a pack of spring roll wrappers hanging out in the cupboard for the longest time. I see spring rolls in my future! I read somewhere that you can only buy Soy Curls off the shelf within Portland. So weird! I loved assembling these — so much fun! I keep hearing that too, but as luck would have it, I can buy them on the shelf at a wine store about 40 minutes away from me! It's owned by a couple of vegans, and they have lots of vegan specialty products, including Soy Curls. I haven't found them anywhere else in the state, but I'm glad that they have them there! so lucky! I've never seen them anywhere on the shelf! I hear you! After weeks of rain, we are in the middle of a heat wave. I cannot stand it either. 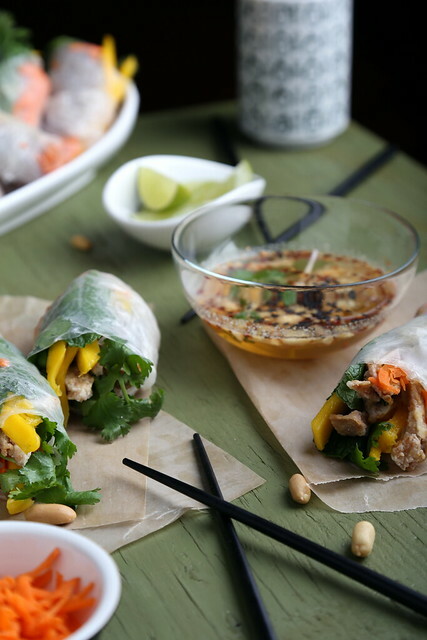 But I think you can read my mind – spring rolls are perfect for this kind of weather.